Alter The Press! 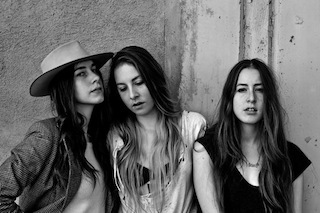 : Haim New Album "Coming Very Soon"
Haim New Album "Coming Very Soon"
Haim have revealed in a new interview that they have already started to write their next album. When speaking to BBC 6 Music, guitarist Alana said the band will start recording the follow-up to Days Are Gone next month and promised that "it'll come very soon."